According to the municipal Department of Tourism, the capital city welcomed some 3 million foreign visitors in the period, up 26 percent year on year. They came from nearly 190 countries and territories with China, the Republic of Korea and Japan topping the list. Tourist attractions in Hanoi include Huong Son relic site, Vietnam Museum of Ethnology, Ho Chi Minh Mausoleum and Ngoc Son temple. The department attributed the increase to development investment and planning of tourism products, expanded tourism promotion and improved quality of tourism products. 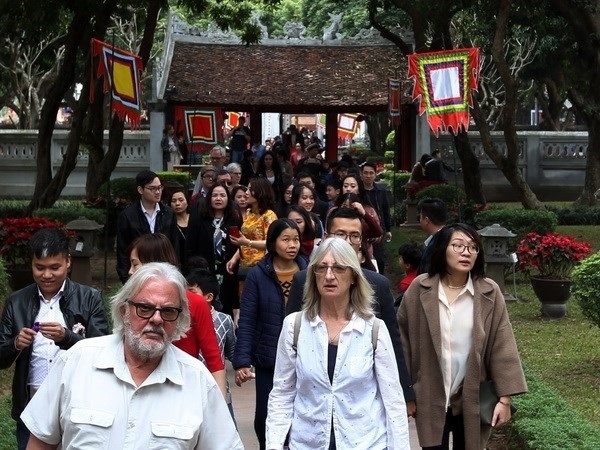 From now to the end of 2018, the sector will hasten the upgrading of infrastructure and plans to develop Bat Trang pottery village and Van Phuc silk village, and carry out a planning scheme to turn Ba Vi-Suoi Hai site into a national tourism site by 2025. The department will also support businesses in tourism promotion both inside and outside the country, while inviting travel agencies to participate in domestic and international tourism events. Last year, the capital city welcomed nearly 5 million foreign vacationers, up 23 percent against the previous year.